One of the major “policy thrusts” adopted by the Government of India is known to be to follow a still unexplained “Gujarat model of education” for the country as a whole. Not only very little official information is available on what this “model” is and how top policy makers wish to pursue it, latest data of the Socio Economic and Caste Survey (SECC), released by the Centre suggest that Gujarat one of the worst performers at higher levels of learning. SECC data, collected in 2012-13, but had to “wait” till they were checked and rechecked by different state agencies before they were released, are still incomplete, as they lack gender and caste breakup, especially for education. Yet, they do point out that just about 2.72 per cent of the rural people of Gujarat are graduates, which is one of the worst in the country. 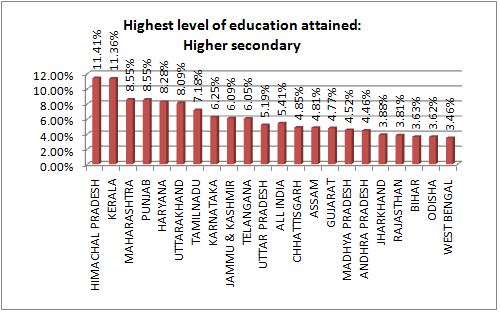 In fact, there are as many as 14 out of 21 major Indian states which perform better than Gujarat on this score. 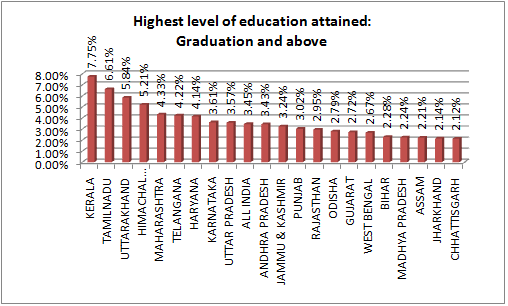 And, only poorer states have a still lower proportion of graduates – West Bengal (2.67 per cent), Bihar (2.28 per cent), Madhya Pradesh (2.24 per cent), Assam (2.21 per cent), Jharkhand 2.14 per cent), and Chhattisgarh (2.12 per cent). The situation is not very different for the rural population whose highest level of learning is up to higher secondary. 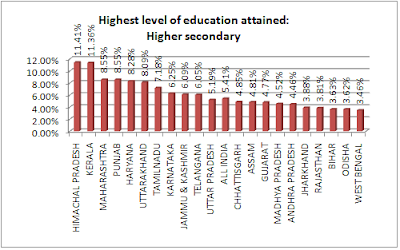 In this category, Gujarat’s 4.77 per cent of rural population has attained higher secondary education, which is worse than 13 other states of India. The states which have performed worse than Gujarat on this score are Madhya Pradesh (4.52 per cent), Andhra Pradesh (4.46 per cent), Jharkhand (3.88 per cent), Rajasthan (3.81 per cent), Bihar (3.63 per cent), Odisha (3.62 per cent), and West Bengal (3.46 per cent). In fact, the SECC data suggest that, while at the primary level of learning, almost all those who studied in Gujarat may have passed out. However, things worsened as one reached higher levels of education. Thus, Gujarat has the sixth highest literate per cent of rural population, and the highest per cent of rural population which has primary level as the highest proportion of education. 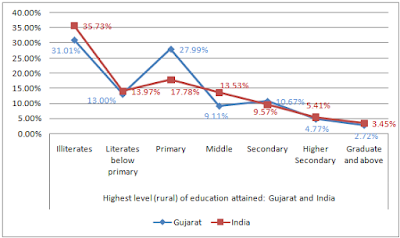 However, as for the higher primary level, where the “compulsory” promotions taking place at the primary level finally end, Gujarat’s percentage of those with the highest level of education (eighth standard) is one of the worst. 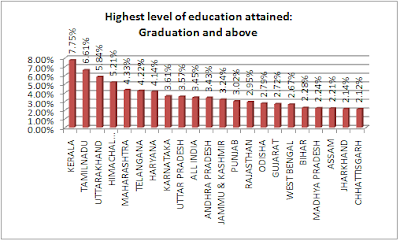 With 9.11 per cent, the only state which has a still lower proportion of higher primary (or middle) as the highest level of education is Bihar (8.81 per cent). While the data do not provide any gender or caste breakup, an earlier Annual Status of Education Report (ASER) suggested (click HERE) that in the age-group 11-14, Gujarat's 7.6 per cent of girls were found to be “not in school” as against the all-India average of 4.4 per cent. Further, in the age group 15-16, a whopping 30.2 per cent of girls were “not in school” as against the all-India average of nearly half as much, 17.3 per cent. ASER survey by high profile NGO Pratham said that state-wise distribution of “not-in-school” girls in the age-group 11 to 14 that all states except two perform better than Gujarat – Rajasthan, which failed to send 12.1 per cent of girls, and Uttar Pradesh which failed to send 9.2 per cent of girls to school. Coming to the age-group 15-16, only one state, Rajasthan, performed worse than Gujarat, Rajasthan, which failed to send 31.4 per cent girls to school.